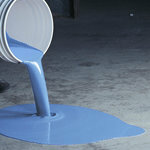 The first choice for a decorative epoxy surface. Large selection of colored aggregates to use as solid colors or tweed combinations. A seamless epoxy that tenaciously bonds to concrete, wood, steel, aluminum, glass or ceramics . Easy to clean. High grade epoxy formulation. The anti-skid surface is non-shrinking, quick setting and resistant to physical shock, abrasion, water, acids, alkalis and solvents. @ 70F: light traffic, 4-6 hours. Premeasured 5 gal kit for easy application; Components Include: 1/2 gal Part A (resin), 1 qt Part B (hardener), 40 lbs PArt C (aggregate) - volumes and weight approximate. Decorpoxy™ is approved for shipping to all 50 states by ground or air.